Seventy-seven percent of U.S. households will be tidying up their homes this spring, according to the American Cleaning Institute’s (ACI) National Cleaning Survey. The top spaces that will be cleaned include windows, closets and drawers, curtains and blinds, carpet and home offices. When the weather warms up, many people take the opportunity to make progress on spring cleaning. As you’re clearing out junk, picking up yard waste and filling garbage bags in the coming weeks, here are some tips for cleaning up and properly disposing of waste. The kitchen is an often overlooked space in your home. Deep clean your kitchen by clearing out expired food from your cupboards, clearing out your fridge, disinfecting your trash can and cleaning your oven, countertops and sink. When cleaning your fridge and cupboards, remember that metal food cans, pans, aluminum foil and other clean metal can be recycled. Glass bottles and containers are also recyclable. Don’t forget to rinse out food containers before tossing in the recycling bin. Do a sweep of your living spaces for unwanted clutter and items you no longer use. After you’ve collected a pile of unwanted items, make a plan for thoughtful disposal. Family Promise of Grand Rapids will accept gently used furniture and household items. For larger furniture pieces that are challenging to dispose of, there are a number of organizations – such as Salvation Army and Habitat for Humanity – that will pick up old furniture if you schedule an appointment. After you declutter, do a deep clean. Wipe down windows, dust ceiling fans and scrub down your baseboards. Don’t forget to open your windows to let in some fresh air. Now that the snow is (hopefully) gone for good, you’re probably starting to notice branches, old leaves and other unwanted brush have accumulated. Remember compost, wood and yard waste can be handled through your local municipality. This may include trees, stumps, wood, grass clippings, soil, dirt, sod and other materials. For a full list of yard waste disposal sites, visit reimaginetrash.org/material/yard-waste. If you have a gas grill, be sure to do a maintenance check. Remember to check your propane tank so it’s full for summer. If you have old propane tanks, they can be dropped off at the North Kent Recycling & Waste Center and the South Kent Recycling & Waste Center. If you use a smaller portable grill, do not put disposable propane tanks in the recycling bin. 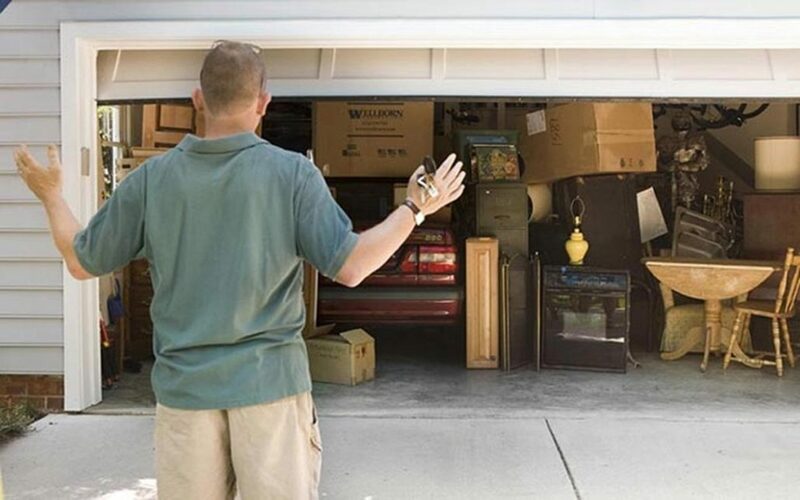 You may find an array of old or unwanted items that have been collecting dust when cleaning out your garage or basement. From retired technology to old toys to tools you no longer use, there are options for donating or recycling these items. North Kent Community Services in Rockford accepts clothing, shoes, accessories, handbags, books, records, CDs, DVDs, working electronics, small working appliances, sporting goods and more. Computers, phones, tablets and gaming systems can be recycled at Comprenew, which has drop-off locations in Grand Rapids, Coopersville and throughout West Michigan. Valley City Electronic Recycling in Kentwood also accepts electronics. When clearing out the nooks and crannies of your house and garage, you may also find hazardous materials like old ammunition, batteries, medications and other hazardous materials. Dispose of old medications and ammunition properly by taking them to the Kent County Sheriff’s Department. Alkaline batteries may safely be placed in your trash. Rechargeable and automotive batteries can be recycled at various drop-off sites in the area. Kent County’s SafeChem program provides locations and a weekly schedule for disposing of hazardous and toxic chemicals. Spring is the perfect time to refresh your home and take care of chores neglected throughout the winter. Hopefully these tips give you some ideas for tackling your spring cleaning list. Don’t forget to search our recycle & disposal guide for a full list of various drop-off locations and services throughout Kent County to safely and responsibly dispose of old or unwanted items.